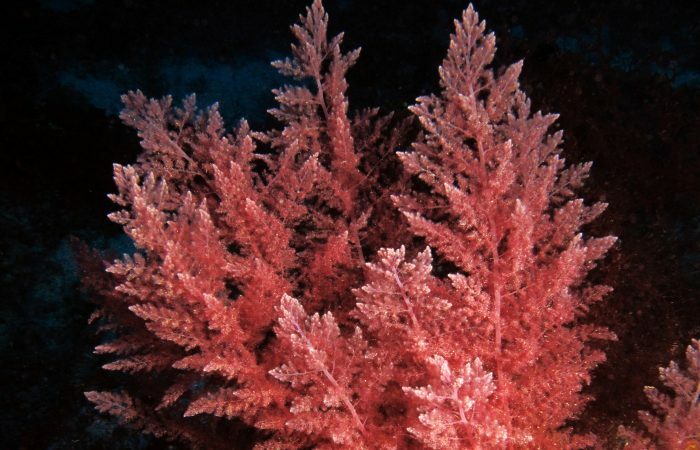 Asparagopsis taxiformis, known as Red Algae, is a species of red algae or Rhodophyta, with cosmopolitan distribution in tropical to warm temperate waters. This species has been introduced into the Mediterranean Sea around 1798-1801, being first found at Alexandria, Egypt. It is likely that there were two separate introductions: one by shipping and the other via the Suez Canal. 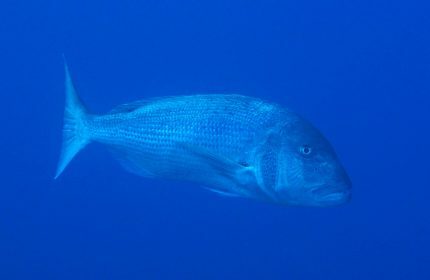 The species in now widely distributed in the Mediterranean Sea. The genus Asparagopsis belongs to the family Bonnemaisoniaceae, order Bonnemaisoniales, subclass Rhodymeniophycidae, class Florideophyceae, subphylum Eurhodophytina, phylum Rhodophyta, subkingdom Biliphyta, kingdom Plantae and empire Eukaryota. The word Rhodophyta derives from the Ancient Greek words ‘rhodon’ meaning ‘rose’ and ‘phyton’ meaning ‘plant’. This phylum is one of the oldest groups of eukaryotic algae. The Rhodophyta also comprises one of the largest phyla of algae, containing over 7,000 currently recognized species with taxonomic revisions ongoing. Many studies published since 2005 have provided evidence that agrees for monophyly in the Archaeplastida (including red algae). However, other studies have suggested Archaeplastida is paraphyletic. As of today, the situation appears unresolved. If one defines the kingdom Plantae to mean the Archaeplastida, the red algae will be part of that kingdom. On the other hand, if Plantae are defined more narrowly, to be the Viridiplantae, then the red algae might be considered their own kingdom, or part of the kingdom Protista. Asparagopsis taxiformis gametophytes tend to be from 10 to 20 cm tall, with several to many erect and generally with plumose fronds. Plumose portions are up to 3 cm in diameter, with their lower axes usually naked and up to 2 mm in diameter. Branching starts at the lower fourth or third of each axis. The colouration of Asparagopsis taxiformis is dark rose to dark red unless subjected to intertidal exposure. Tetrasporangial phase is uncommon in intertidal or shallow subtidal habitats but common as epiphyte on large number of other algae from depths of 4 to 60 metres. Their habitat is normally intertidal to shallow subtidal; in areas of constant water motion. Red Algae lack motile sperm. 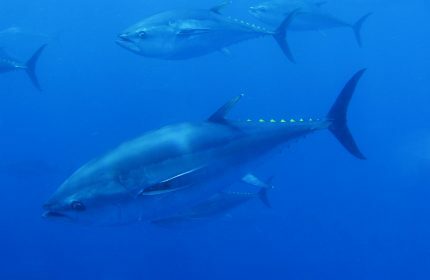 Hence, they rely on water currents to transport their gametes to the female organs, even though their sperm are capable of “gliding” to a carpogonium‘s trichogyne. Moreover, the reproductive cycle of red algae may be triggered by factors such as day length. The photo of this Red Algae was taken at a depth of 40m at Ras il-Ħobż on Gozo’s south coast.